COLOGNE HAVE STRONGLY criticised the security at the Emirates Stadium last night after both they and Arsenal were charged by Uefa for the crowd disturbances which marred their Europa League tie. Visiting supporters were issued with 3,000 tickets but around 20,000 fans of the German club are believed to have made the journey to London. The start of Thursday’s Group H match was delayed by around an hour as ticketless Cologne fans tried to gain entry to the ground in north London and there were clearly thousands of away supporters sitting among Arsenal fans, causing a security risk. The Metropolitan Police said five people had been arrested on suspicion of public order offences and three officers had been injured as a result of the disorder, none of seriously. Cologne said in a statement that the trouble had occurred because its supporters had been given an insufficient number of tickets while Arsenal said they would launch a “full review” of what happened. Both clubs now face disciplinary proceedings from governing body Uefa. Cologne fans are accused of crowd disturbances, setting off fireworks, throwing objects and causing acts of damage, while Arsenal face a probe for “stairways blocked in away supporters sector”. Uefa said it would deal with the cases on September 21. “1. FC Köln is proud that tens of thousands of Colognians wanted to experience the first European FC match in 25 years and made their way to London,” the Cologne statement read. “The overwhelming majority of our fans have represented the club, the city of Cologne, and German football happily and positively. The London locals and the police shared these feelings on social media leading up to the match. “Due to the enormous demand for tickets, it would have been sensible, not least for security reasons, to allow more than the allocated 5% of stadium capacity to the guest fans. It was apparent that thousands of people from Cologne would seek to avoid the restrictions and get tickets in every way possible. One such way would be through the help of Arsenal supporters, who passed on their tickets to the FC fans. Some as gifts, but some also for horrendous prices. Arsenal FC has described the extent of this second ticket market as “disappointing” and has announced that further clarifications of the circumstances will be evaluated. “Despite 1. FC Köln and Arsenal FC urging fans to purchase tickets only through official channels and not to enter any sections other than the guest section wearing FC merchandise, the situation before the match showed FC fans lining up in various sections to enter the stadium. And also despite the tremendous experience of both the London security forces and Arsenal as a permanent partaker in European football, the organizers were unfortunately not adequately prepared for the task. In our view, the security concept and communication seemed inadequate and the police force too small. “The most important common goal of having the match played on the same evening was achieved by allowing fans with valid tickets to quickly take their seats. This procedure proved to be the correct decision. Finally, the course of the match showed that the mixing of home and away fans did not constitute a safety risk for this match. 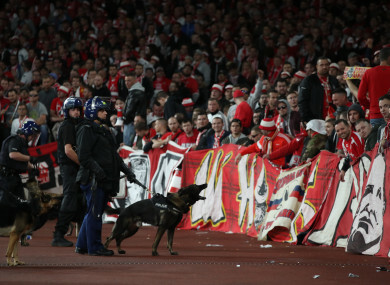 Email “Cologne issue statement criticising Arsenal security after both clubs charged by Uefa ”. Feedback on “Cologne issue statement criticising Arsenal security after both clubs charged by Uefa ”.